Oxygen nourishes the body and sustains the cells. Even though your skin cells may be on the surface, they need to receive oxygen from inside, helping them heal and sustain their structure. Intensified oxygen allows cells to heal and regenerate, encouraging collagen production, volume and elasticity in the skin. Hyperbaric oxygen therapy facilitates oxygen delivery to your skin, helping rejuvenate and improve the youthfulness of your face. Every cell needs oxygen, demanding it from the air you breathe. Your skin cells take what they need to survive, but are they receiving enough to thrive? As you get older, every cell begins to deteriorate. Infused oxygen gives new life to skin cells. It helps them heal and recover, facilitating new growth and enhancing collagen production, elastin and a youthful appearance. 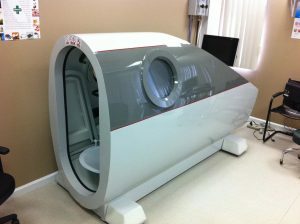 Most people have heard of hyperbaric chambers as used in deep sea diving. These chambers allow the body to reacclimate and decrease the risk of decompression sickness from diving. However, they are also used for improving health and healing. The chambers create increased air pressure, about three times the normal pressure, which allows for enhanced absorption of oxygen. At AuraSpa, we use the HYOX HTU2 monoplace hyperbaric chamber system, one of the best options available for oxygen therapy. What does this mean for anti-aging benefits? It allows cells to have access to more oxygen, even those in areas of the body with poor circulation. This can lead to improved healing, rejuvenation of cells and overall health. Not only can you look better with hyperbaric oxygen therapy, you can feel rejuvenated and enjoy a higher state of wellness. To learn more about our hyperbaric oxygen therapy and other anti-aging treatments, contact our AuraSpa Healing Center in Beverly Hills to schedule a consultation. We have invested in hyperbaric chamber therapy to offer enhanced healing and wellness for our patients, as well as improved anti-aging benefits.